Penn State gains a few yards on first down but Hackenberg is sacked on second down. Third down comes up incomplete so Sam Ficken is on the field to attempt a 40-yard field goal that is no good wide right. Michigan essentially runs three plays for no real gain and will settle for a short field goal that is blocked. Michigan will get the ball to start the second overtime. Michigan gets the ball first and settles for a made, 25-yard field goal. Sam Ficken does the same from 36-yards out. Michigan will play defense first in triple overtime. Allen Robinson fumbles the ball on a end-around and Michigan recovers. The Wolverines are wide left on a 33-yard attempt. In the fourth overtime Penn State will play defense. The Wolverines make a 40-yard field goal to extend the lead to 40-37. Penn State converts a fourth down and Bill Belton scores a few plays later after a pass interference call in the endzone sets up first and one on the two. Penn State faces a 2nd and 5 to open the fourth quarter. Penn State converts and keep the drive going. Penn State's drive stalls just outside the 30 and Sam Ficken is wide left on the 47-yard attempt. Michigan responds with a five play, 70-yard drive in just under three minutes of play. The Wolverines extend the lead to 10 with 10:28 to go. Glenn Carson was beat deep and Gardner connected with Funchess for his second score of the night from 37 yards out. Penn State responds with a long drive of its own, moving the ball but a false start ruins the Nittany Lions' momentum and a Sam Ficken 43-yard field goal cuts the game to a one score contest with 6:35 to go. Hackenberg connected with Allen Robinson for a 16-yard strike and Belton converted a fourth-and-one play earlier in the drive. Michigan coverts key third downs and a defensive pass interference call that extends the drive and requires Penn State to burn all three timeouts. Michigan kicks the ball to Penn State with just under a minute to play. In a series of plays that need to be seen to be believed, Penn State drives 80 yards in 4 plays and 23 seconds to tie the game. Penn State ties it with 27 seconds to go and Michigan will get the ball back. Michigan comes up short on a 52-yard field goal attempt. Michigan recovers a fumble and returns it for a touchdown to open the second half. Penn State takes the ball back and fails to convert on third down. Safe to say it's not the opening to the second half Penn State was looking for. The Nittany Lions are able to stop Michigan on third down and a personal foul penalty backs the Wolverines up into a long yardage situation. Penn State gains some of the momentum back but will be well served to move the ball to in the very least flip the field. Penn State can't move the ball, and a Michigan interception gives the Wolverines the ball at the 26. The Nittany Lions dodge another bullet and Michigan settles for a field goal to cut the lead to a single point. Christian Hackenberg settles down and leads Pen State on a 50-yard drive that ends with a Sam Ficken 45-yard made field goal. A good response by Penn State's offense after a pretty horrible opening to the second half. Michigan is stopped on a third down but tight coverage by Adrian Amos leads to a pass interference call. The Wolverines capitalize and score only a few plays later as Gardner hits Jeremy Gallon on a well run route for a 14-yard score. Christian Hackenberg: 9-15 for 111 yards and 3 TDs. Brandon Felder: 3 catches, 46 yards, 2 TDs. Devin Gardner: 6-12 for 88 yards. Penn State gets stopped again and Alex Butterworth blasts a 66-yard punt that goes into the endzone. The Wolverines convert a long third down on a Gardner scramble. Multiple defenders missed tackles on the play. Only two plays later Anthony Zettel intercepts Gadner to give the Nittany Lions the ball on Michigan's 20. Hackenberg throws to a wide open Jesse James to give the Nittany Lions a 14-10 lead following a Ficken extra point. 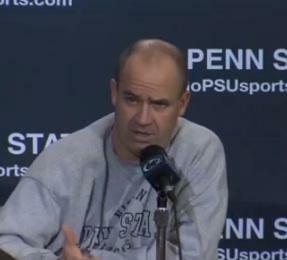 Bill O'Brien alluded to the tight ends becoming more and more involved in the game and they have already today. Penn State follows up the touchdown with a big three and out for the defense. The Nittany Lions drive the ball converting three straight first downs thanks to the NASCAR offense and a 24-yard pass to Brandon Felder over a Michigan defender that sends the Beaver Stadium crowd into a frenzy. Michigan is able to drive the ball but a stout Penn State defense prevents any substantial gains. Gardner is hit and fumbles the ball and Penn State recovers on the Michigan 47. The play is reviewed and upheld. Penn State's defensive front has been physical and has been able to prevent the Wolverines from sealing the edge. Penn State has 6 stops in the backfield so far today. The Nittany Lions can't move the ball after Adam Breneman drops a third down pass that was low but in his hands. Michigan goes three-and-out to end the half after punting to Penn State. The Nittany Lions kneel the ball to take the 21-10 into the half. Penn State will kick to start off the game and the Wolverines will start with the ball at the 30. DaQuan Jones with a tackle for a three yard loss on the first play from scrimmage. Devin Gardner gains those yards back on a three yard run the next down. The Wolverines go three-and-out and Penn State will get the ball at the 35. Zwinak gains eight yards on the Nittany Lions' first play and Brandon Felder catches a Hackenberg pass to convert a short first down. Two plays later Hackenberg hesitates and throws an ill-advised pass into coverage and it's intercepted. Michigan faces a long third down again and Penn State's Jordan Lucas steps in front of Gardner's target and intercepts the pass. Penn State starts with the ball inside the Michigan 20. Christian Hackenberg connects with Felder on third and eight for a touchdown on a play that Penn State's offensive line dominated the line of scrimmage giving Hackenberg almost too much time to pass. Michigan moves the ball on a few short plays before Devin Gardner finds a wide open Devin Funchess for a 59-yard score. Penn State's defense has given up a score following a Nittany Lion score on several occasions this year. Penn State moves the ball a short distance but can't convert the third down. O'Brien elects to go for it on fourth and one on the 39 yard line. The Nittany Lions don't convert. Michigan can't take advantage of the short field and O'Brien dodges a bullet. Michigan stops Penn State again but the Nittany Lions hold the Wolverines to a field goal from 47-yards out after the crowd creates a false start penalty on a fourth-and-one attempt. Penn State is facing a big test Saturday evening as the Nittany Lions will take on the undefeated Michigan Wolverines at 5:00 PM. Penn State is 6-10 all-time against Michigan. 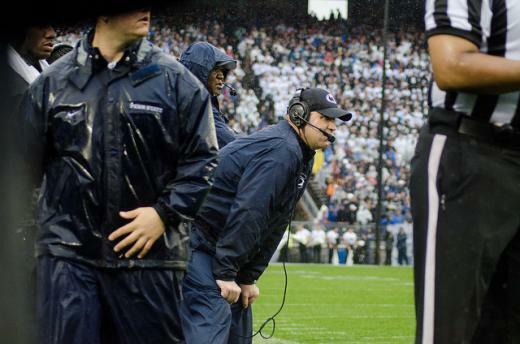 The Nittany Lions have won the past three contests dating back to 2008. Michigan enters Saturday ranked No. 18 in the country but has yet to play in a big time environment. The Wolverines almost fell during their only other road contest, taking on Connecticut and coming from behind to win 24-21. Michigan is led by head coach Brad Hoke who is 24-7 in his third year in Ann Arbor. Hoke has yet to coach against the Nittany Lions as a head coach while at Michigan. It must be a big game, the Goodyear blimp is floating above Beaver Stadium.